For the first time in decades, Thailand, the world’s biggest rice exporter, will not buy direct from farmers in the coming season, a move likely to prompt a jump in exports that will push down world prices. It marks a dramatic reversal of fortune over the last year for the rice market, which saw global prices surge along with other foodstuffs in early 2008 as funds flooded into commodities on speculation of rising demand. Coming on top of rising sales from No. 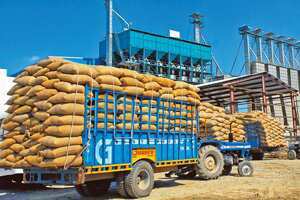 2 exporter Vietnam and increased output from Myanmar and Cambodia, a flood of grain from Thailand could quickly push benchmark export prices down by a quarter to $400 (Rs19,360) a tonne or lower, analysts and traders said. “If there is no weather catastrophe or any sudden drought, I expect Thai rice prices to fall to around $380-400 a tonne by the end of this year due to rising supply," said Chookiat Ophaswongse, president of the Thai Rice Exporters Association. For the moment, benchmark 100% B grade white rice is holding at $540 per tonne, helped by the government’s decision to extend its buying programme until the end of September in the face of protests by farmers. That is exactly half the record high of $1,080 per tonne seen at the height of a panic over food security in April 2008. Thai prices have slumped since early 2009 when demand subsided as most big importers had secured supplies. The fall was in line with global trends as supply in key producing countries is on the rise, including in the US. Vietnam expanded its rice stockpiling scheme last week, saying it would buy another 500,000 tonnes on top of the 400,000 tonnes it bought in August to stop prices falling under the weight of the 35.99 million tonnes (mt) the US Department of Agriculture says the country will produce in 2009. But Thailand has said it will no longer support farmers by buying directly from them, as it has done for years, citing the need to cut huge storage costs. Thailand will still help farmers, but from now on it will be by setting a benchmark and paying farmers the difference if they are forced to sell to millers at a price below that level. Moreover, the rice the government has bought in the past and now holds in its stocks will add to the downward pressure on prices—since traders know it will be released at some point. Thailand is holding its highest ever rice stock of 7mt and has failed to push ahead with a plan to reduce it. In India, rice stocks have risen to 30.1mt from 23.2mt a year ago. Traders said that was high enough to satisfy domestic consumption but not enough for the country to return to the export market in a big way.